Those who may not recognize New England pianist Anthony Geraci simply by name will no doubt be familiar with him through his longtime “day job” – or perhaps more accurately in this instance, being that he’s a musician, “night job” (or should we just say “primary gig”?) – as keyboardist with the internationally known Sugar Ray & the Bluetones. A founding member, in fact, of both Ronnie Earl & the Broadcasters and the Bluetones, with whom he’s spent the past three and a half decades, Geraci has, both alone and with those bands, played and recorded with some of the world’s greatest blues musicians. While Geraci’s debut recording on Delta Groove Music may initially appear little more than another terrific Bluetones record, featuring as it does fellow band members “Monster” Mike Welch on guitar, Michael “Mudcat” Ward on bass, Neil Gouvin on drums, and Sugar Ray Norcia on vocals and harmonica, a closer inspection reveals that Fifty Shades of Blue truly is more about Geraci than his band: in addition to his fellow Bluetones, the album includes appearances by several other artists with whom Geraci has worked throughout the past five decades, among them, vocalist and harmonica player Darrell Nulisch (Anson Funderburgh & the Rockets, Ronnie Earl & the Broadcasters, James Cotton Band) and female vocalists Toni Lynn Washington and Michelle “Evil Gal” Willson (collectively dubbed “the Boston Blues All-Stars” for purposes of this project), with Geraci also having penned each of the baker’s dozen of songs that appear here, along with producing the record. We’ve never met or talked with Geraci, but we have been fortunate enough to hear him play as part of the Bluetones (and to speak with his colleague and fellow Bluetones founder Michael “Mudcat” Ward a while back about the band and their Living Tear to Tear album) and would have to guess from this recording that he’s a bit of a modest guy: he doesn’t sing, so he’s brought in a few guys and gals he knows can, and the contributions from his bandmates and other guests help make Fifty Shades of Blue a lot more than just another album of blues piano numbers. 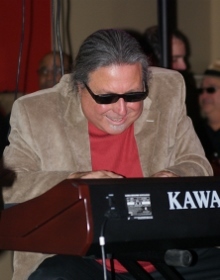 While Geraci’s playing is of course prominent throughout the project, it’s never overdone, with the frequency and length of Geraci’s solos nicely balanced by those from the other musicians, resulting in a diverse and delightful mix of well-written tunes that span the spectrum from straight blues to country and jazz to boogie-woogie and more. The album opens on the brooding but hopeful blues of a Nulisch-sung “Everything I Do is Wrong”, followed by the jazzy, swinging title track, a playful duet from Norcia and Willson. The slow shuffle of “Sad but True” is one of several songs on which Bluetones frontman Norcia contributes on harmonica as well as vocals, along with “Heard That Tutwiler Whistle Blow” and the later Ray Charles-like ballad “Your Turn to Cry”, with Nulisch doing the same on a shuffling “The Blues Never Sleeps”. Norcia is back on vocals for a pair of other tracks, first, the soulful, swaying “Don’t Keep Me Waiting” and, then, the slow country waltz of “Too Late for Coffee” (the following thought of the chorus being “too early for beer”) with its pretty piano from Geraci, while Nulisch checks in at the mic one last time for the soft, lonesome blues of “Cry a Million Tears”. Along the way, Willson returns on vocals for the slinky grooves of “If You Want to Get to Heaven”, and Washington offers a swinging, sassy number in “Diamonds and Pearls”, but perhaps the biggest treats here are the two instrumental numbers that come at the program’s end in the boogeying “In the Quicksand, Again”, featuring some stinging guitar from Welch, and the passionately dark “Blues for David Maxwell” that combines some nice bite with a tinkling of the ivories from Geraci that you know his late friend and fellow New England blues pianist Maxwell would have both greatly respected and enjoyed, before taking a peaceful, jazzy turn two-thirds of the way through, with Norcia on Native American flute and Ward supplying some fine bass. 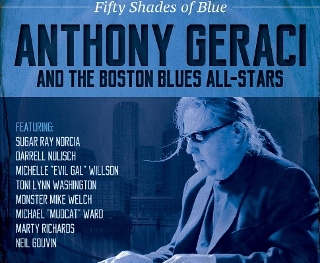 Giving Fifty Shades of Blue a spin, it’s easy to hear how Geraci was able to rack up four nominations in this year’s Blues Music Awards (in the album of the year, traditional album, song – for its title track – and pianist categories). Regardless of whether Geraci takes home awards in any of those categories (which we’re betting he will), Fifty Shades of Blue is already a winner with us! This entry was posted in Albums and tagged Anthony Geraci, Darrell Nulisch, Michael Mudcat Ward, Michelle Evil Gal Willson, Monster Mike Welch, Neil Gouvin, Sugar Ray & the Bluetones, Sugar Ray Norcia, Toni Lynn Washington. Bookmark the permalink.